Bridgeport Mighty-Rite® Insulated throat grounding split bushing is suitable for use in situations where wires have already been pulled through conduit or EMT fittings. This grounding split bushing of trade size 1-1/2-inches, features zinc-plated steel construction for longer endurance. This low-profile bushing employs hinged design to easily adjust and align even in tight spots. It measures 1.55-Inch ID x 2.3-Inch OD. 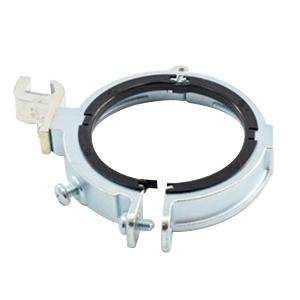 The adjustable aluminum alloy 6061-T6 grounding lug of this nylon-insulated grounding split bushing accepts conductors of size 14 - 1/0-AWG. Grounding split bushing is UL/cULus listed, NEMA FB-1 rated and RoHS compliant.